Experiential (or project-based) learning is not for everyone. That isn’t to say it shouldn’t be required of all students. But unfortunately, not everyone will receive the full benefits of participation. Here’s why: the very nature of an experience means it is hands-on, practical, even experimental … and sometimes, experiments fail. And people don’t like to fail. In fact, even talking about failure in an educational setting sounds like a recipe for disaster, but it doesn’t have to be that way. Remember the story about the accidental discovery of penicillin? Dr. Alexander Fleming could have just cleaned up his messy workspace and thrown away the moldy Petri dishes in frustration. However, his curiosity back in 1928 led to a tremendous medical breakthrough. In fact, Fleming did not single-handedly commercialize penicillin; teams of researchers used his initial findings and cultivated the vaccine over time. In our current societal mindset, where every participant receives a satin ribbon just for showing up because we do not want to hurt anyone’s feelings, students need to learn the harsh reality of how to cope with and learn from failure. As public administration practitioners and educators, how can we encourage our students to attempt activities that might result in failure? One way we can help them gain these valuable skills is by offering (and requiring) experiential learning courses in our public administration programs. Recently, I met a graduate school recruiter who explained that given the cutthroat environment of law school and the high expectations for both grade-point average and class rank, law students invariably select easier elective courses. These courses could boost their GPAs and rank among their peers, but at the expense of more practical courses that could benefit them professionally in the long term (such as clinicals, which offer hands-on experience but are viewed as a GPA risk). This illustration is not intended as a slight to law programs. Yet the point remains that students of any academic discipline are often afraid to try new things when the ramifications of failure are too risky. George Santayana wrote at the turn of the last century in The Life of Reason: The Phases of Human Progress, “Those who cannot remember the past are condemned to repeat it.” What are we trying to avoid repeating, if not our past failures? Spoiler alert: everyone fails, at some point or another. What we need our students to understand is that failure, especially in the context of a dynamic environment like an experiential learning course, can be a tremendous launching pad for new and better ideas. Taking a wrong turn with a novel project idea or trying a new activity in an internship that turns out to be a huge flop can be turned into a valuable learning experience. According to Maxwell, “Every failure you experience is a fork in the road. It’s an opportunity to take the right action, learn from your mistakes, and begin again.” It is the learning and restarting part of that quote that needs to resonate with our students. Let us not throw out those moldy Petri dishes, so to speak. When we encourage our public administration students to get out there and tackle the biggest problems of our time—knowing they will fail along the way—we just might graduate world-changers who are not afraid to get back up and try again. I would say the more “hands on” the learning experience the better. I wish I had had hours of role-playing tough supervisory situations. I didn’t find reading books about organizational theory was very helpful in dealing with difficult personnel issues in my career. Thank you for your comment. I remember how difficult it was the first time I had to take disciplinary action and place an employee on probation. Managing the situation live was much different from reading about the policies & procedures in a manual. Thank you for putting a positive turn on “failing.” I do everything I can to not fail, but sometimes I just have to accept that I did and move on. Experimental learning is not easy for me because I seem to need specific instructions to feel comfortable in the process. Wish I lived close enough to you to learn that process. Thank you for your article. I am sharing with my granddaughter who also cannot allow herself to admit failure and learn from the process. 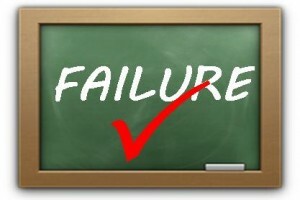 I wish I could say that I always handle failure well, but it is still difficult every time. There’s always something to learn from it, though. Thank you for your comment!